🌿 CHARCOAL CLEANSING + FACIAL OIL 🌿 (🍁 Organic Hemp Seed Oil + Activated Charcoal 🌚 + Geranium + Clary Sage) This is a great 1st Oil Cleanser! Nourish your skin, don't strip it. I source the finest Organic Cold-Pressed Unrefined Hemp Seed Oil, rich in Linoleic Acid + vitamins + minerals and then blend it with essential oils. This is a balanced formula ideal for all skin types, especially acne-prone and anyone new to oil cleansing.All of my cleansing oils are safe for all skin types. If you have oily or acne-prone skin, oil cleansers are perfect for you. Oil Cleansing, the OCM, changed my skin and continues to amaze me. There is a ton of info below, but the short version : Massage the oil into dry skin for 1-5 minutes, and then remove. TADA! The longer you massage, the more time the oils have to open your pores, encourage lymphatic drainage, and thin sebum. Because you aren't stripping your skin, you don't HAVE to follow with anything else, if you don't want to. Honestly, this is my favorite way to cleanse, because I don't always feel up to a ten minute routine, and with this, I know my skin is clean and moisturized. What makes this a "CLEANSING + FACIAL OIL?" Most cleansing oils on the market are made with cheap filler oils and an emulsifier to make the oil rinse clean. The problem with this becomes that there is still a tendency for the emulsifier to strip your skin. So, even though you might be using an "Oil Cleanser," you may be stripping your skin. This oil is made with the finest Cold-Pressed and Organic Oils on the market, cold-blended with essential oils and natural Rosemary Antioxidant. These are ingredients you would see in a several hundred dollar serum or facial oil, and they are in your cleanser. Once you remove the oil used for cleansing, this oil can be re-applied as your facial moisturizer. What other face wash can you use to remove your makeup, unclog pores, gently cleanse without stripping, and then moisturize without clogging pores? All of the Bear's Beauty CLEANSING + FACIAL OILS is the answer :) I love that if I decide to switch up cleansers and use a cream or foaming cleanser that I can still use my Cleansing Oil as a Facial Oil or even Pre-Cleansing Oil. As a pre-cleansing oil, this can be massaged into skin and then removed and followed up with a second cleanser, such as a gentle foaming wash or cleansing grains. Bear's Beauty products are not made for specific skin types, but for specific skin issues and concerns. I formulate every product with truly sensitive skin in mind. This means, any skin type can use all the products in my line. 🌿HOW DOES THIS COMPARE WITH OTHER BEAR'S BEAUTY PRODUCTS? WHICH IS RIGHT FOR ME? Bear's Beauty Cleansing Oils are made to be used interchangeably as your skin changes with seasons, hormones, or just as it heals from years of commercial chemical skin care. When choosing a cleansing oil, do so based on the most prevalent skin concern or just what sounds groovy ;) I use Organic Oils + Herbs + Essential Oils in all formulas, wherever possible. The coolest part is that your skin will change. If you have always had oily skin, chances are a few months into the OCM you will find your skin strangely matte. As your skin changes, you can adjust your cleanser to suit without throwing off your routine, because you will still use an oil. cleanser. I offer a range of Cleansing Balms and Cold Creams, as well as Cream and Clay Cleansers ... even a gentle foaming face wash. No matter how your skin is behaving, Bear's Beauty has a simple solution. ❤️Doesn't strip skin or require additional products or steps. 2. Pump a few pumps of cleansing oil into palms and warm between dry palms. 5. I wipe the excess oil off my hands at this point with the face cloth I am going to use to remove the oil. You can also use tissue or just wash your hands - You don't have to do this, I just don't like having oil on my hands. 6. Gently remove the oil with a dry microfiber or flannel. If you have damaged, acne-prone, or sensitive skin; do not steam or heat your pores and do not use the cloth hot and wet. The idea is to let the oil do the work. 7. Once the oil is removed, your skin should feel clean. Do not leave oil on your skin. 8. You can stop here. 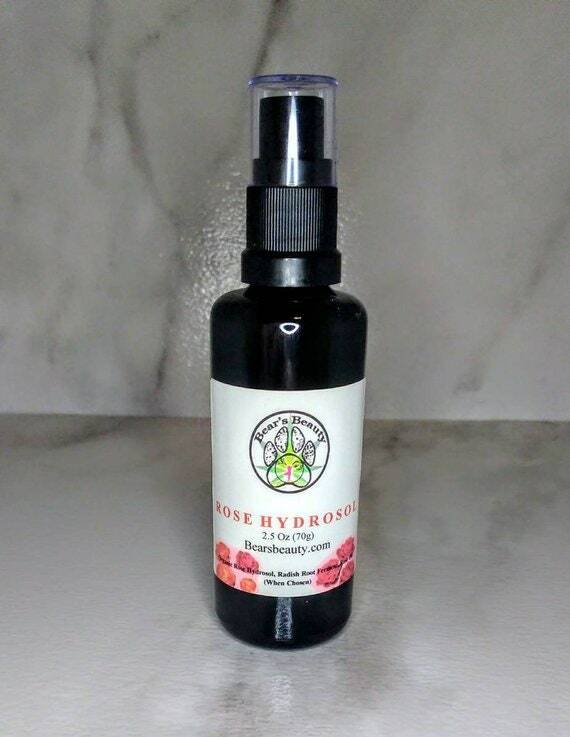 You can just mist your skin with Hydrosol. You can do toner, serum, and moisturizer. 👉Integrating the OCM into your routine. All Oil Cleansers now come with one Microfiber Cloth, I feel that of all the things I have tried over the last few years, microfiber cloths are the most effective + offer gentle exfoliation + leave your skin clean without the need for a second cleanse. You initially want to use the OCM once per day, ideally in the evening. This does not mean that you can't use it more than once a day. Skin care is very personal, and your skin will change with age, weather, and hormones ... so be open to changing your routine with your skin. For example, in the winter I love to do a light oil cleanse in the AM and then jump in the show and follow with a scrub. At night I will do a deep (10 minute) oil cleanse and then remove with a damp cloth. 🌟 🌟 Easy Oil Cleansing - No cloth required - I use this method, especially when getting in the shower and for super sensitive broken skin. 1. Massage quarter size pool of oil into dry face. Focus on areas like the crevice of your nose and chin that have texture. Massage for 3-5 minutes. | If you want a less messy application, massage in five pumps at a time, and add more slowly until skin is slick. 2. Use Bear's Beauty's foaming face wash, pump 3-6 pumps into palm and massage right into cleansing oil on your face. Avoiding eye area. 1. QUICK OIL CLEANSING - Great for those who don't wear makeup or for morning cleansing. Massage a dime size pool of oil between palms to warm. Massage into dry face and neck in circular motions for 2-5 minutes. Remove with dry or damp microfiber cloth. No need to follow with anything else. 3. DOUBLE OIL CLEANSING - Follow #1 to break down makeup, massaging oil into closed eyes last. Remove with dry cloth and then repeat. Follow #2. You can also use the OCM first, remove with a cloth, and then follow with a foaming face wash or scrub. 5. OIL MASK | You can leave this on for thirty minutes as a deeply nourishing mask or mix with some clay and apply.